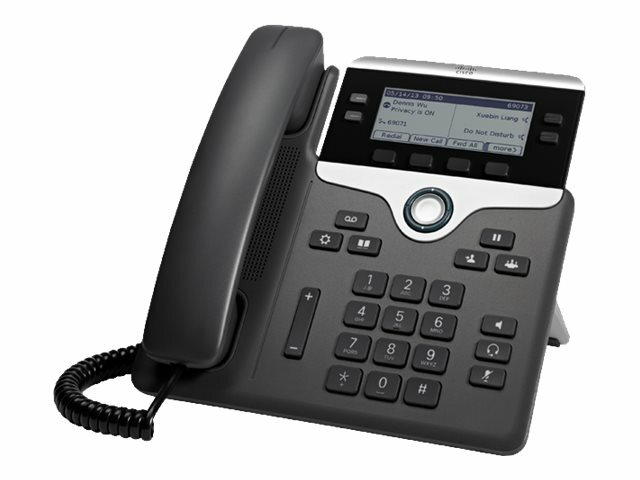 The 4-line Cisco IP Phone 7841 is an ideal endpoint for moderately active voice users. It is well suited for knowledge workers, administrative staff, managers, customer care agents, and supervisors who have moderate to-active VoIP communications needs. The 7841 has a 3.5-inch (8.9 cm) graphical, grayscale, 396 x 162 pixel-based display and is backlit. The 4 programmable line/feature keys feature tricolour LEDs that provide call-status notification at a glance. As options, a wall-mount kit for the 7841 is available for areas without desks or where desk space is limited. A replaceable silver bezel is also available for customers who wish to change out the black that comes standard with the endpoint. The line keys on each model are fully programmable. You can set up keys to support either lines, such as directory numbers, or call features like speed dialling. You can also boost productivity by handling multiple calls for each directory number, using the multi-call per-line appearance feature. Tri-colour LEDs on the line keys support this feature and make the phone simpler and easy to use. Fixed function keys on all models give you one-touch access to service, messaging, directory, hold/resume, transfer, and conference features. A full-duplex speakerphone lets you set up clear multi-party conferences for flexible, productive collaboration. 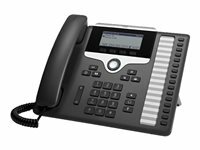 The Cisco IP Phone 7841 sets a new standard in usability and delivers a context-sensitive user experience. It features a high-resolution 3.5” (396x162) greyscale display with white backlighting for easy reading. Localised language support, including right-to-left onscreen text, meets the needs of global users. The IP Phone 7800 Series portfolio is ideal for any mid-sized to large enterprise company that wants to update its phone system from a traditional analog or digital-based system to an IP Communications system. It’s also an excellent choice if you’re seeking to expand your voice communications support with your current Cisco Unified Communications solution. Small businesses who have interest in the Cisco IP Phone 7800 Series, but have investment in or are considering third party hosted call control services, are also candidates for the IP Phone 7800 Series.